It's night-time in the warehouse, but Pallet Jack can't sleep. Something is wrong. He discovers a fire and sets out to wake the others. 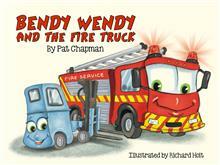 Together, the forklifts get everybody out safely, and Bendy Wendy even manages to call the fire brigade! A delightful rhyming story for children aged 2 to 6. Pat Chapman is the author of more than a dozen books, including the first forklift story, The Tallest Truck Gets Stuck, also illustrated by Richard Hoit. She won a 2017 Storylines Award for The Best Dad in the World, which was followed by The Best Mum in the World. Richard Hoit has enjoyed a long career as an illustrator of children's books, including Joy Cowley's Buzzy Bee series for Upstart Press.